ERROR: Aggregate TCAM region configuration exceeded the available Ingress TCAM slices. Please re-configure. 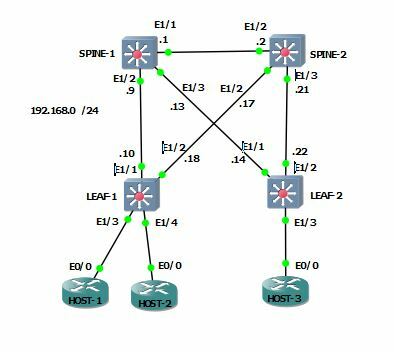 Next we will configure the EVPN address family for BGP. I’ll be using iBGP and since we don’t have a full mesh, i’m going to configure the spines as route reflectors. I’ll now add the VNI to the NVE and tell the NVE to advertise hosts via BGP. Last thing i’m going to do is enable the anycast gateway feature. All of the VTEPs will share the same IP and mac address for all L3 VXLAN Vlans. You should probably make sure you don’t configure a mac address that’s already in use somewhere, so finding some reserved or globally unused OUI space is recommended. You can already see that no advertisements have been received by either side.